LMPerformance offers the Stainless Works exhaust systems, Stainless Works turbo header, off road pipes and more. Our research shows Stainless Works stainless steel products are made from only the finest Everlast 304 stainless steel, which is a premium mil spec grade of stainless steel that is slightly more expensive than standard stainless steel materials. Stainless Works exhaust systems, and Stainless Works turbo headers will never red-rust like the cheaper 400 series stainless steel used by others. 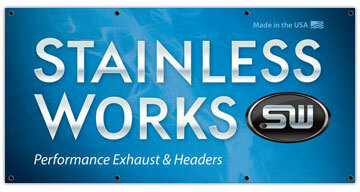 Stainless Works is an industry-leader in stainless steel performance headers and exhaust systems. In addition to designing our wide range of after-market headers and exhausts, they manufacture them on-site, right here in the United States by skilled American craftsmen. LMPerformance is impressed that their systems have proven performance increases through pre and post-dyno testing of vehicles and are made in our country. LMPerformance has found them to build systems that fit and perform better than factory systems. A concours type system will be pressure bent like the original, which impedes flow, and will be routed a little differently than our systems. Their systems are designed to fit and perform perfectly. In many cases they have improved on the fit of the factory exhaust system. Being CNC mandrel bent (as opposed to cheaper less accurate processes) ensures that it will fit well every time. Finding ways to improve upon an already impressive product is the hallmark of a great company and STAINLESS WORKS does just that by investing in the latest and greatest technology; such as, CNC TRUMPF lasers that provide precise welding and cutting for a perfect fit, a CNC press brake for precision bending, a CNC Robotic Cell for consistent machining results. All of these products help STAINLESS WORKS give you a sui generis product with precise mandrel bending for better air flow and as a consequence more power, the reason you are probably considering an aftermarket exhaust system in the first place, and these cutting edge products will also help you to get a perfect fit every time. And if you are a performance aficionado you know the factory installed exhaust system in your car just doesn’t cut it, not only in performance capability but in sound as well, and STAINLESS WORKS thought of that as well. STAINLESS WORKS knows that “one size doesn’t fit all” and for that reason they designed and perfected the S-Tube Muffler that is louder and more aggressive sounding and the Turbo Chambered Muffler with moderate volume and aggressiveness; so they choice is yours when it comes to sound and both will give you a sound that deepens to a low "growl" during acceleration. Combine all of this with an experienced and talented team of designers and production personnel and you have part of the key to a successful company but you also need dedication and willingness to work hard and make changes when these are called for, and there you have it – the key to STAINLESS WORKS success and customer satisfaction. Take a look at the impressive array of STAINLESS WORKS exhaust systems and Stainless Works turbo headers on the LMPERFORMANCE web site and you will see what we mean and find the one that will make your Cadillac CTS V, GMC Sierra, Pontiac Firebird, GTO, G8 and a multiplicity of other models more powerful and better sounding, and get them at a competitive price so that you can begin getting more power and a better sound today. Reviews for Stainless Works's products are show below. I had heard a lot of different exhaust and had settled on the Stainless Works H-pipe model, of which there are two versions with factory connect. I was not able to hear the LMF version I finally decided to purchase. I am quite pleased with the sound and the appearance, however that may be my taste and not yours. The exhaust is quite throaty at start up and has a very good low throttle sound up to 2500 rpm and then it gets quite loud (in a good way). There is not any raspiness as with the x-pipe systems, it is truly a classic sound. At highway speeds it is noticeable, however I didn't notice an drone. I do not think the internet audio does the 2.5&amp;quot; cores any justice and with the 3&amp;quot; cores the same could be said. Also on a finally note LMP had the best price with the SWSALE and the box was shipped directly from Stainless Works in OH on a Thursday and arrived in Texas to my home on Saturday. I must say I was impressed with that.